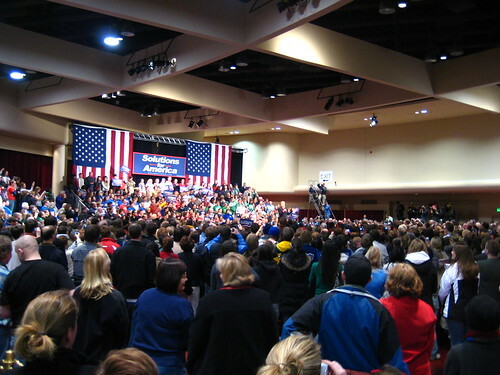 I just got back from Hillary Clinton's speech over at the Monona Convention Center. It was definitely different than Obama's rally. Waiting for Hillary to take the stage, the atmosphere wasn't that exciting. There wasn't a 'buzz', if you will, while everyone waited. A woman to my left kept yelling "We Want Hillary!" a good half hour before she was set to speak, a man to my right kept reminding me that he is 70 years old and graduated from Illinois, someone behind me was having difficulty ignoring both of them, and all I wanted to do was study my Japanese flashcards. 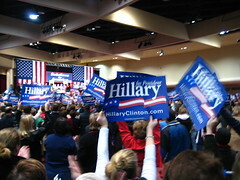 Representative Tammy Baldwin, Dane County Executive Kathleen Falk, and others said a few words before Hillary came on. I didn't necessarily care too much what they had to say, so I got my camera settings ready and took some trial photos. It was all mostly talk about how she was a woman, which was a very poor and disappointing argument on why she should be elected. Hillary's speech itself though was really really good. I was very impressed. It was a lot more informal than I expected. Right before she came on, I noticed they took the podium off the stage and replaced it with a wireless microphone on a stool. She didn't have a teleprompter, but rather a small notecard that I only saw her reference twice. The speech was very passionate, and she drew connections locally to Wisconsin, and even commented on somebody's shirt. (The old man wearing the shirt, was very excited.) Not only did she mention what she wanted to do, but also explained how she would do it, and even acknowledged difficulties she might encounter along the way. However, she talked a good while about ripping away handouts to corporations and political action committees... although she accepted a little under one million from them. 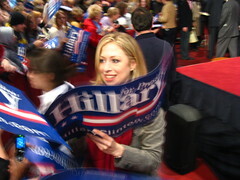 And as much as she voiced her frustration with the war in Iraq, she still voted for the Iraq War back in 2002. I really don't know what I'm going to do tomorrow. I'm going to go ahead and sleep on it.